I won this book in a Goodreads First Reads Giveaway. I didn’t realize when I won it that it was Christian fantasy. When I found out it was, I was pretty sure I wouldn’t like it . . . most Christian fiction I’ve read has been preachy enough that I would’ve found it annoying even if I shared the beliefs it espoused. I needn’t have worried. In a kingdom where the Old Ways hold fast and a man’s worth lies entirely in his skill with the sword, Conor Mac Nir is a scholar, a musician, and a follower of the forbidden Balian faith: problematic for any man, but disastrous for the son of the king.When Conor is sent as a hostage to a neighboring kingdom, he never expects to fall in love with the rival king’s sister, Aine. Nor does he suspect his gift with the harp (and Aine’s ability to heal) touches on the realm of magic. 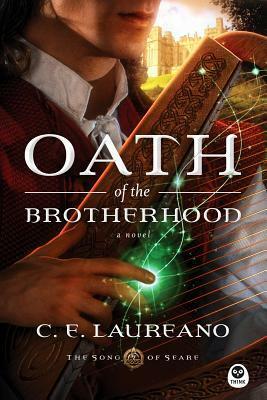 Then his clan begins a campaign to eliminate all Balians from the isle of Seare, putting his newfound home in peril and entangling him in a plot for control of the island that has been unfolding since long before his birth.Only by committing himself to an ancient warrior brotherhood can Conor discover the part he’s meant to play in Seare’s future. But is he willing to sacrifice everything–even the woman he loves–to follow the path his God has laid before him? This was the best book I’ve read so far this year. First, the characters. Conor and Aine are perfectly belieavable. The way they grow up over the course of the book feels very realistic. The villain is delightfully creepy. All of the characters are so distinct and well-written that I may have cried a bit when some died. Second, the language. There were some wonderful metaphors, a particular favorite of mine was “like putting a collar on a warhorse and calling it a hunting dog”. The way the narrative itself was written was captivating, so much so that I kept having to force myself to put the book down to go do other things that needed done. Third, the setting. I’ve read a lot of fantasy. This is the best “Celtic-but-not” setting I’ve ever encountered. It was familiar while still clearly it’s own place. And I dearly loved how well it showed a woman’s place in such a society without villifying or glamourizing it. Fourth, the themes. The power of music and stories. The importance of trusting God’s plan. These are powerful ideas in any society, even ours, that were well handled in this book. And, finally, the story itself. I can’t remember the last time I was surprised positively so many times by plot twists. Even when I could predict what was going to happen, it tended to unfold differently than expected. The parallel stories of Conor, Aine, and the war were all intermingled very well, and the tension and pacing were pretty much perfect. Oh, and mustn’t forget the pronunciation guide at the back. That was very helpful, and I may steal the idea for my own fantasy novels, assuming they ever move past the vague ideas stage. In short, this was a wonderful book, and I can’t wait to read the rest of the series. I received this book through a Goodreads’ First Reads giveaway. It didn’t stay the best book I read last year. That honor goes to The Name of the Wind, which I’ll be posting my review of around the end of July if all goes according to schedule. But it was still a very, very good book and I’m still planning to get and read the sequel. Comments aren’t working right at the moment for boring, technical reasons, so if you wish to contact me . . . oh, grand, looks like that page isn’t working either. My email address is shannon@universal-nexus.com, if you have anything you’d normally say in a blog comment you wish for me to see. Sorry about any inconvenience. And, as usual, sorry this is a day late.